Unlike his brother, Khye don't have much hair. And also unlike his brother's spiky hair when small, Khye has soft hair like mine. So I wasn't in a hurry to bring Khye for a haircut because his hair was growing slowly and it was way more neat. But for the last few weeks, Khye's hair has gotten somewhat more messy, with some strands of hair longer than the others, which made him seem like balding. lol. 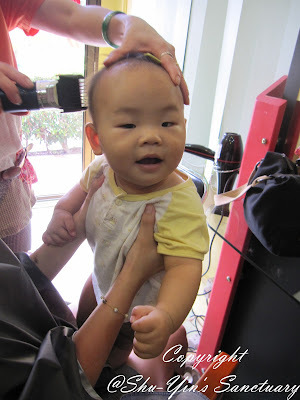 So we decided to bring him for a haircut at almost 10 months old. 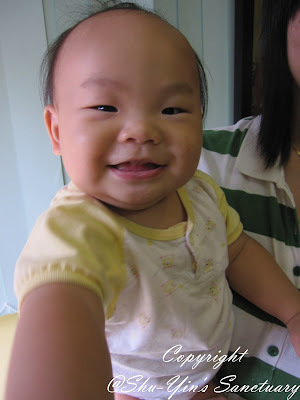 This is Khye before the haircut. See his very little hair? 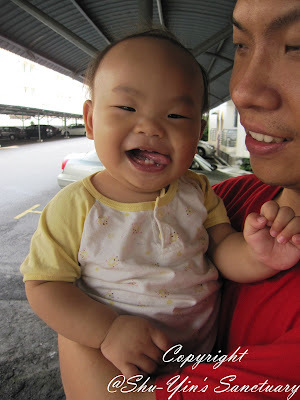 He was being very cheeky, and kept on sticking out his tongue when he smiled. 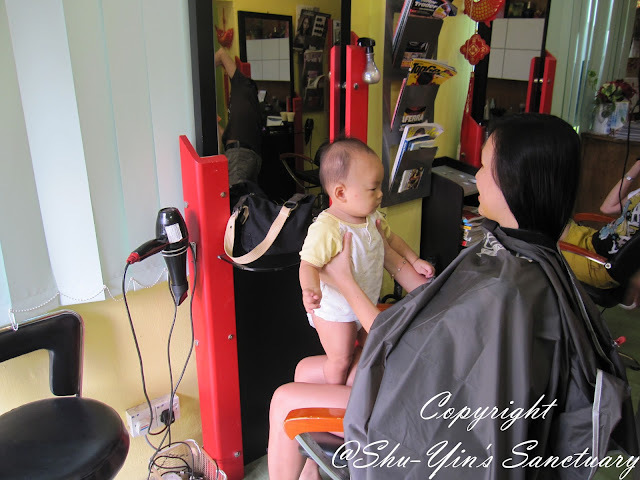 Brought him to the Prima Tanjung Hair Salon, which I always bring Shern there. He was still being very cheeky. Since Khye can't really sit on the stool yet (which is without harness), so I had to carry him. I was the one being wrapped to protect my clothes. Lucky I knew about this and had dressed Khye in an old top, and short-less, and just wearing a disposable diaper. 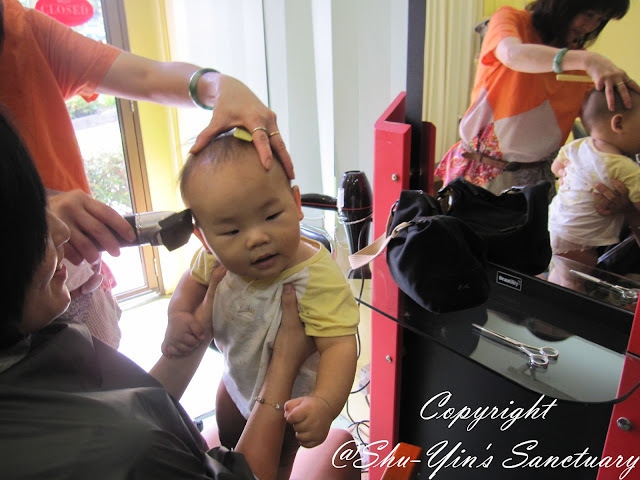 I told the aunty, I wanted to trim his hair real short, no need to go all bald. All I wanted was for his hair to grow more evenly from then on. And then the shaving starts. Khye was behaving quite well. There were no cries or protests. Only Khye looking at the hairdresser, wondering what she was doing with his head. lol. 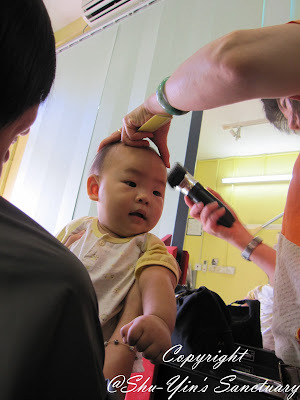 Shern's eyes sometimes closed a little, knowing that the shaver is touching his head. Maybe he felt a ticklish sensation or something. This is Khye, hair nicely trimmed, and looking good. 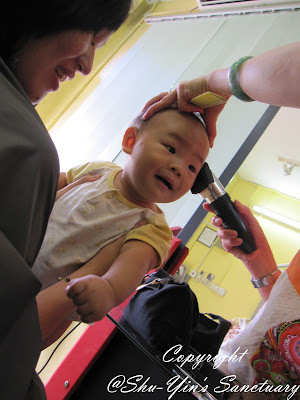 He looks so much like his brother Shern when he was this age. 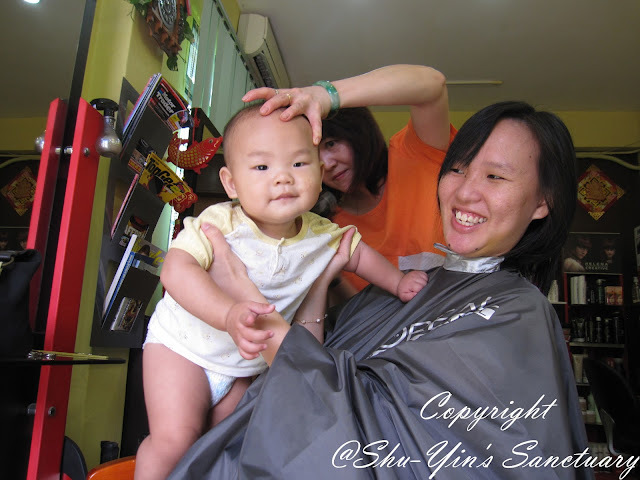 OK, so Khye's first hair cut went well.